Who? We are reaching out to everyone in the world who cares about the things that mattered to Hasan. He was an enthusiast as well as a scholar – and not a professional art historian (as he was quick to remind us!) Hasan had little time for academic boundaries, but plenty of time for building community around shared interests. Even though I haven’t had nearly enough time to read through all the tributes being published these last few weeks, Hasan is always in my thoughts and my work and I will strive to have his contribution recognized by the ‘establishment’. 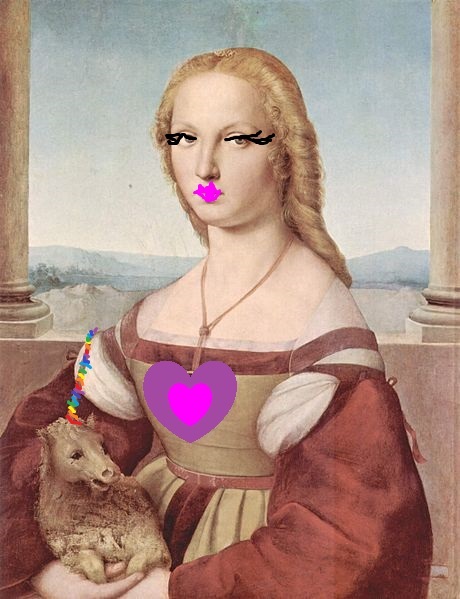 So in his memory, and because I know it would have made him laugh, I’ve Charlotte-i-fied Portrait of a Lady with a Unicorn (1505-06) which Hasan himself wrote about back in 2012. My home and office are liberally sprinkled with internet/meme favourite – the unicorn – so what better way to signal the depths of my digital connection with Hasan. Hi Charlotte! This mash-up of “Portrait of a Lady with a Unicorn” is something that Hasan would have really appreciated! I even like the detail that you added with the unicorn’s horn. I have several photoshopped images that Hasan created for me as jokes, and your picture definitely fits with his humor and personality.